This comes after a survey published by Men’s Health magazine earlier this year; found that a whopping 40% of men would consider having cosmetic work done. The buzz about metrosexuals may have died down, but men’s desire to look good certainly hasn’t. These days, many are turning to Botox to smooth out frown lines and forehead creases. Allergan, the manufactures of Botox, said the percentage of male Botox clients at the average Aesthetic practice has grown from just under 2% five years ago to about 25% percent in 2010. Not so long ago, those wrinkles (or transverse forehead rhytides, as we plastic surgeons and dermatologists like to call them) might have been thought of as masculine signs of wisdom or maturity. But that sentiment appears to be changing as I and many of my colleagues report a steady stream of men signing up for Botox injections. Though the off-label use of Botox (the commercial name for diluted botulinum toxin) to treat wrinkles has been around since the mid-’90s, the number of people seeking the treatment rose sharply when the Food and Drug Administration approved it in 2002 to lessen the glabellar lines between the eyebrows. In 2001, doctors performed 856,000 cosmetic Botox procedures, including 106,000 on men, according to statistics from the American Society of Plastic Surgeons. In 2010, 6.6 million procedures were performed, of which about 700,000 were on men. 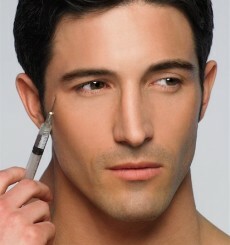 Still, the idea of men using Botox, which is made by Allergan, is hardly mainstream. But for those who are seeking wrinkle relief, there may be more options in the near future. Reloxin, another injectable form of the botulinum toxin, from Medicis Pharmaceutical and Ipsen, has recently been approved by the F.D.A., breaking Allergan’s Botox monopoly. Allergan has started marketing more directly to men. There is a prominent pitch on the Botox Web site (www.botoxcosmetic.com), noting that the product “is certainly not just for women,” and a pamphlet features the Olympic gold-medal swimmer Mark Spitz, who started using Botox this year. Researchers say the most common reasons male patients cite for using Botox include looking better for social and romantic ends, succumbing to their wives’ encouragement (or demands), and, perhaps most important, a desire to remain competitive in the workplace, especially for those in finance and business. Excessive sweating is also treated with botox and provides fast, effective relief. Medically speaking, there are only slight differences in the way Botox affects the typical man and woman. The procedure works the same way in both, eliminating or reducing wrinkles by temporarily paralyzing and atrophying the facial muscles that cause them. But men often have thicker skin and stronger muscles, and frequently require higher doses. When I first started treating my patients with Botox around 7 years ago, I had one male patient (myself), I was quite happy with this situation because I was one up on the competition, today however the picture is completely different, the word is out, and my male patient population has grown into the 3 figure mark. Ultimately, however the quest for satisfying ones need to represent their best self to the world cannot be regarded as a preference of sexuality or gender but rather a common decree for all human beings, men and woman alike.